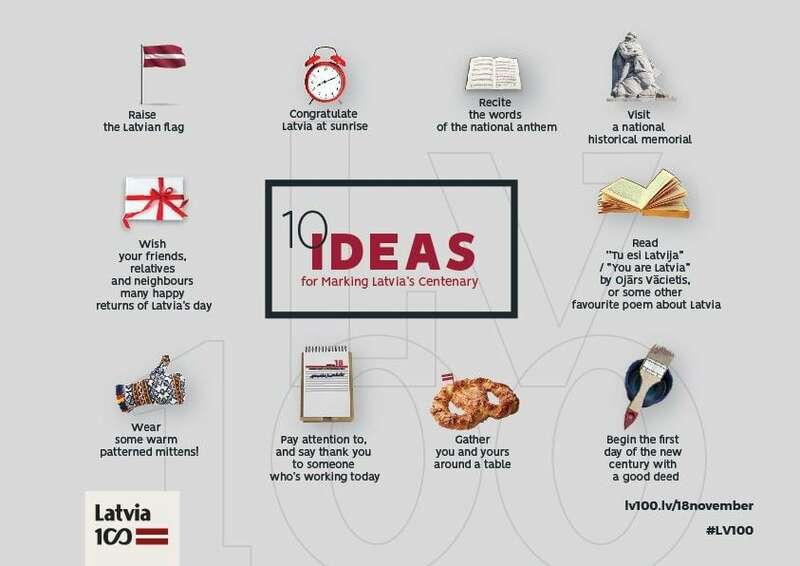 On the 18th of November the centenary of the proclamation of Latvia’s independence will be widely celebrated in Riga, Latvia and all over the world with a range of formal and informal events. Here are some ideas on how to get yourself in the mood, or, create your own celebration. Congratulate Latvia at sunrise. On the 18th of November, the sun rises at 08:11. Say Happy Birthday Latvia as you raise your first cup of deliciously-smelling coffee. In true Latvian spirit, that should be somewhere outside in nature, but the balcony of your apartment is fine too. It’s the thought that counts on this day. Raise the Latvian flag. Whilst you may not have a flagpole and might think it a little excessive, a discreet lapel pin, or a vase of maroon and white flowers at the office is perfect. Recite the words of the national anthem. Sing it or teach it to a younger member of the family. On this one day, think about the words that normally flow unconsciously. Visit a national historical memorial. Lay some flowers and light a candle to honour your ancestors and someone who has fought and given their life in the fight for Latvia’s independence. Pay attention to, and say thank you to someone who’s working today. For public authorities, shop assistants, public transport drivers, restaurant staff, concert and theatre staff, journalists, entertainers, it will be a working day so that the rest of us can enjoy the festivities. Read “Tu esi Latvija” by Ojārs Vācietis, or some other favourite poem about Latvia. “Never forget this, the most sacred of all ....” for you yourself are Latvia, in the words of whicever writer resonnates most in your heart. Gather you and yours around a table. Meet up with friends and relatives long unseen, invite your friends and that neighbour who lives alone, to share food and savour the joy and bond of being together. Wish your friends, relatives and neighbours many happy returns of Latvia’s day. Phone your friends, send a postcard, give gifts of colourful mittens to warm not only the hands but also the heart and the eye of the wearer! Make a plan with your friends to do something significant for Latvia during the next century. Wish them something meaningful that comes from the heart. Give your friends and family a new suggestion for an activity to spend time together. Wear some warm patterned mittens! Whether you can decipher the patterns or not, they are there to give you strength and unite you all in celebration. It’s warmth for the hands and a treat for the eyes. Begin the first day of the new century with a good deed. Do something that until now, you haven’t had the time or courage for. Phone your parents. Paint that old fence. Start reading that book that you’ve long been meaning to. Finally say – “I love you”. Pick up something forgotten. Start work on your new century project. The size of what you achieve is irrelevant, it’s the warmth of your heart that matters. On the 18th of November, everyone is invited to a number of public state events, or to celebrate in a circle of family and friends. Wear a pair of mittens and send messages to your friends using the hashtag #LV100. Information about all events on the 18th of November is available here www.LV100.lv/18novembris.